and inspects the most elaborate mantrap in the world. MONTE CARLO was in the hands of the tourists, or rather the glorified ocean-cruising tripper. The huge liner lay just outside the port, a hideously incongruous object, making the Casino, the Café de Paris and the hotel look more than ever like pasteboard toys from a child's play box when up against the material realities of life. On the crowded quay men and women were struggling into numbered automobiles or embarking upon adventures of their own in small voitures. Up the steep steps, a short cut into the center of the place, climbed Mr. William P. Coglan, Mr. Ernest Inman and Mr. Paul H. Doggit. "Say, boys, ain't this great?" Mr. Inman exclaimed, taking off his strangely shaped gray felt hat. and wiping the perspiration from his forehead. "We're here right ahead of the others. Some spot, eh?" "Fine!" Mr. Doggit agreed, as soon as he could get his breath. "It's the goods!" Mr. Coglan echoed enthusiastically. "What about a quick one?" They crossed the road towards the Hotel de Paris bar. Peter Hames, who had just issued from the hotel, came face to face with them. He recognized Mr. Ernest Inman with a little exclamation of surprise, and Mr. Inman recognized him with an exclamation in which many sentiments were mingled. Mr. Inman let himself go. "If it isn't Peter Hames!" he cried. "God bless my soul! They told us over in New York that you were living in these parts, but to tumble on you like this! Why, we haven't landed here two minutes. I call this fine." Mr. Doggit and his companion, confidently awaiting an introduction, loitered expectantly in the background. Mr. Inman continued his ecstasies in a slightly lowered tone. "Inman, the name—insurance broker, Garden Street, New York." "I see," Peter Hames murmured. "Incognito, eh?" "You must meet, my friends," Mr. Inman insisted, with renewed heartiness of tone. Introductions were effected. Peter Hames good-humoredly followed the three to the bar. "How's the insurance business?" he asked. "Going fine," Mr. Inman declared. "To tell you the truth, I'm over on this side to try and land something big." "Why, I thought you'd come on this excursion steamer," Peter Hames remarked. "So I did—quickest way of getting here. She don't waste much time until after she leaves here. Say, Hames, you might be just the man I'm looking for, to give me a few pointers." "Glad to be of any service to you," was the cordial assurance. "What is it you want to know?" Mr. Inman picked up his tumbler. "Will you boys excuse me for five minutes?" he begged. "Chalk another round up to me. 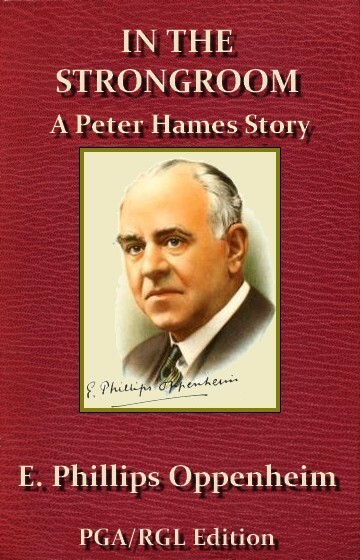 Mr. Hames was in the same line of business as me in New York, and maybe he can tell me something I'm wanting pretty badly to know." They waved him away with words of hearty acquiescence. Inman proceeded to a small table and seated himself opposite his old friend. He was a man somewhat inclined towards corpulence, but well set up. His cheeks were sunburnt with the voyage, and his eyes a peculiar shade of steely blue. At a first glance he was very much like Mr. Doggit, Mr. Coglan, and a few hundred other inhabitants of New York and the district, who had landed from the steamer. At close quarters, however, he had a mouth which told its own story. "Mr. Hames," he began, "I was sorry to have to bluff a bit. You'll forgive me, I know. I came over on that boat because I thought I'd find one man I'm looking for on it. I believe he is there all right, but I haven't tumbled to it yet. I was terribly afraid you were going to get the 'Inspector' out. Nobody's wise to my walk in life, and I don't want them to be. "You chose a pretty good alias," Peter Hames observed, smiling. "I got as far as the In." "My name's Inberton still in New York, but Inman on this cruise," the latter went on. "I'm still at police headquarters, but I've been promoted since you left. There's one question I should like to ask you: Do you know an elderly gentleman resident in these parts by the name of Sir Stephen Driscoff?" "I know whom you mean," Peter Hames admitted. "Very few people know him personally." "Do you happen to know if he's here now?" "I saw him yesterday, driving out of his villa." There was a flash of satisfaction in the Inspector's eyes. "A couple of miles. Unless you have very influential introductions, though, I warn you that he's almost impossible to see. He is, or pretends to be, in a very delicate state of health, has a doctor practically living in the house, and menservants who lose their jobs on the spot if they admit anything in the shape of visitors." "I guess I'll find my way in," he remarked. "Now I must be getting back to those boys. They want me to finish the tour with them, but this is as far as I'm going. I've had my baggage shifted off quietly." Peter Hames made his adieus to the other two men and went on his way. The Inspector, who had walked with him to the door, watched him thoughtfully until he had disappeared. This meeting with his old acquaintance in Monte Carlo presented something of a problem to him. SIR STEPHEN DRISCOFF, ex-diplomat, multimillionaire and man of mystery, was taking his usual morning promenade in the orangery attached to his magnificent villa on the slopes of Roquebrune. The windows were flung wide open to the soft Mediterranean breeze, and the air of the place was heavy with exotic perfume. Great palms reached to the summit of the domed roof. There were ferns of rare varieties banked up against the wall, and floating lilies, with their curious aroma, in the pool into which the waters of a fountain fell with soft, rhythmical cadence. Sir Stephen had been a large man and even now, though gaunt and wan, he was a commanding figure, leaning upon his ebony stick as he passed backwards and forwards. His gray but still heavy eyebrows met in a frown as he recognized the approaching figure. He was a man of routine, and the time had not yet come for him to receive his secretary. A rather stout little dark man, however, came hurrying up to him. "You cannot have finished the letters yet," his master interrupted him. "I have not, Sir Stephen." the man admitted. "I was disturbed by callers. As you know, Sir Stephen, it is very seldom I suggest such a thing, but I think that you should receive them for five minutes." "Nonsense!" his employer exclaimed. "What are you talking about, Martin?" "One of the two is Mr. Peter Hames," the secretary proceeded. "He is quite well known here—an American—wealthy—who paints a little for a pastime. The other is a detective from police headquarters in New York." "What the devil does an American detective from New York, or Mr. Peter Hames for that matter, want with me?" Sir Stephen demanded. "That is what I think you had better give them the opportunity of explaining." Sir Stephen struck the tessellated pavement with the end of his stick. "What the devil," he complained, "is the use of my keeping you and a dozen menservants in the house purposely to protect me from visitors, when you come and suggest that I should receive a young man whom I scarcely know from Adam, and a New York detective?" "Today is Thursday," the secretary observed calmly. "There have been between ninety and a hundred callers already this week, not one of whom has done more than sign his name in the book. I have not suggested that you should see one of them." "Bring them here," Sir Stephen enjoined curtly. The secretary disappeared and returned a few minutes later, ushering in Peter Hames and his American acquaintance from the boat. The Inspector, away from his associates, had a very professional appearance. Even the swing of his broad shoulders suggested officialdom. Sir Stephen, seated in his chair, watched their approach with a frown. "These are the two gentlemen of whom I was speaking, Sir Stephen," Martin announced. "Mr. Hames you have met several times. As you go out so seldom, you have probably forgotten him. The gentleman whom he has brought with him is Inspector Inberton of New York, who wishes to see you upon business." Sir Stephen nodded not unpleasantly to Peter Hames and looked keenly from under his bushy eyebrows at his companion. At a gesture from him, Martin brought chairs. "Living in the neighborhood as he does," Sir Stephen said, "Mr. Peter Hames probably knows enough of my habits to be aware that I do not receive visitors. Perhaps you will let me know the nature of your business, Inspector, as briefly as possible." "You can have it in a very few words, Sir Stephen," was the almost brusque reply. "This is no visit of courtesy, I can assure you. I come in pursuit of my duty. A fortnight ago a man left New York for Monaco with the sole purpose of robbing you." "And how the devil do you know that?" Sir Stephen demanded. "Isn't that rather a foolish question, when you consider my profession, and my position, for which Mr. Hames can vouch, in the New York police force?" the Inspector rejoined gruffly. "It is our business to keep tabs on our criminals, and to know what they're up to. As a rule, we're not particularly concerned with their activities in foreign countries, but you were once well known in New York, and the Chief thought that you should be protected." "Who is this fellow then, and what does he want to rob me of?" Sir Stephen asked, with grudging interest. The Inspector's manner showed signs of irritation. Sir Stephen was evidently a new type to him. "He isn't expecting to pull a million francs out of your safe, or anything of that sort," he replied sarcastically. "You have a document which he is after—a document which, we understand at headquarters, a firm in the city has made several attempts to obtain from you in the ordinary course of business." "What is this man talking about, Martin?" Sir Stephen inquired testily. "Say, I'd like you to understand this, my friend," the Inspector broke in. "I'm not here for the good of my health, nor am I wasting a lot of money to amuse myself. In the course of our investigations, we discovered that a notorious criminal, who is also the most accomplished burglar in existence, had accepted a large sum from a syndicate to come over here and rob you. No one has anything to gain by stopping it. So far as my personal feelings are concerned, I should even prefer to let the matter slide. If you would kindly bear that in mind, this conversation might go a little more smoothly." Sir Stephen adjusted an enormous monocle, which he seldom used, and stared at the speaker. When he let it fall, he drew a little sigh. "You certainly remind me of the years I spent in New York," he admitted. "The only trouble is, if I may say so, I never knew an American private individual, or an American institution, to interfere to save an outsider from being robbed, unless they were deriving some benefit themselves." "I guess you'll have to listen to a little plain talking from me, sir," the Inspector observed. "You're a millionaire, and a knight or a baronet, or something—we don't take any stock in that rubbish over on my side—but, when you talk about America, you don't know what you're speaking about. Police headquarters of New York has nothing to gain for itself by putting you wise to the fact that you're the mark of a gang. It's just a matter of international courtesy that brings me over here with the hope of laying hands on a criminal we're very anxious to catch. I've brought Mr. Hames with me so that you should have no doubt about my bona fides. Mr. Hames was in the force with me as a younger man. If you—"
"Yes, yes," Sir Stephen interrupted, "I don't doubt your bona fides. Perhaps I'm a little irritable this morning, Inspector. Get right on with it, and tell me about this gang that are going to try to rob me." "MAY I ask a question?" Martin begged. "The firm that you said had been trying to purchase this document in the ordinary way of business—was it the Incorporated Finance Trust of Wall Street?" "That's right," the Inspector agreed. "I think I can explain something of the matter then, Sir Stephen," his secretary volunteered. "I have brought to your notice two or three times the fact that they have written to acquire an option you once bought from a man named William David Harding—a six years' option, it was, I think, expiring next year, to purchase certain lands in Texas and Oklahoma—not far from a famous oil field." "I remember," Sir Stephen reflected. "I didn't want to have anything to do with the affair, but I had made a little money one way and another through Harding, and he needed the cash. That was all he had to offer. Yes, we've got the option all right. I suppose they've discovered there's oil there, eh?" "Looks like it," the Inspector agreed. "They began by offering to buy it back for twenty thousand dollars," Martin continued. "They increased that to forty thousand. Last week we had a cable offering fifty thousand. Acting on Sir Stephen's instructions I replied that the option was not for sale at the moment, and I wrote to our solicitors in New York requesting them to send an expert to report upon the property." "Well, there we have the whole affair," he pointed out. "Your friend Harding, or the people who now own the land, want to get hold of that option at any cost. They haven't been able to buy it, so they've engaged the cleverest burglar in the world to come and rob you of it." "And where is this light-fingered gentleman?" Sir Stephen inquired. A frown slowly darkened the Inspector's countenance. Momentarily, at any rate, he seemed to lose his air of supreme self-assurance. His tone betrayed signs of irritation. "There were seven hundred people on board my boat," he confided. "I bet a hundred dollars that I could spot Joe Marven before we were out three days. I lost my money." "You mean then that you couldn't find him, and you have not the slightest idea as to his present whereabouts?" Sir Stephen suggested ironically. "You fellows aren't so smart as you used to be." "I know that he is in Monte Carlo, anyway," the Inspector declared. "It's here I wanted to arrest him—in your strongroom, or wherever you keep your papers." "How do you know I keep my papers here at all?" Sir Stephen demanded. "I have three other houses, not to speak of interests in a few banks." The Inspector answered a little wearily. From his manner one would judge that he was beginning heartily to dislike his host. "Do give me credit for knowing something now and then, sir," he begged. "What we know, we know through the man who squealed about the job. We had it from him, after he had left the syndicate, that all your private papers and documents were kept at this villa here; that it was supposed to be burglar proof, but that you had a weakness for keeping no money in the house, only gold and silver plate." Sir Stephen was obviously somewhat taken aback. "That syndicate you're speaking of must have a fairly intelligent espionage system over on this side," he admitted. "It is perfectly true that I seldom keep more than a few thousand in the house, but most of my documents are in my strongroom here, because it amuses me to go through them sometimes, and there is, of course, gold and silver plate. Except for that—although I consider mine is the most perfectly burglar-proof house in the world—I haven't a thing worth stealing—not a thing, I mean, that would be really portable." The Inspector's smile was supercilious in the extreme. "I've heard of those burglar-proof houses," he remarked, with a twinkle in his eyes. "However, let's get back to hard facts. I don't want to waste time, and I mean to have my man on the steamer from Marseilles by the day after tomorrow. Try to get this into your head: Your house is going to be broken into tonight." "You say that you have been unfortunate in losing a bet about spotting your man coming over," he observed. "I will give you a chance to get it back again. I will bet you five hundred pounds that no burglar in the world, tonight or at any time, reaches my strongroom; or, if he does reach it, that he does not help himself to a single document in my safe." "YOU wouldn't like to give me odds, sir?" the Inspector ventured. "Five hundred pounds is a great deal to a man in my position." "Five to one," Sir Stephen acquiesced. "Now, come along. Martin, get your keys. Mr. Hames will excuse us, I am sure, because what I am going to show to a detective who lives in New York, I couldn't show to a resident here, if he were the Prince." Peter Hames rose to his feet. "Well, there's nothing more I can do for you, I suppose, Inberton?" he asked. "Nothing at all, thank you," was the cordial reply. "Your introduction to Sir Stephen was all that I needed." "Remember me to the Chief, and all of them in New York," Peter Hames enjoined. "If you have any time to spare and care to look me up, they'll tell you at the Hotel de Paris how to find my villa." "No luck for me that way, I am afraid. I have to get my extradition papers visé'd this afternoon, and I expect tomorrow I shall have a little playmate with me. Many thanks all the same." "Glad to have seen you, Mr. Hames," Sir Stephen grunted, holding out his hand. "You understand, I am sure, the feeling I have about divulging the secrets of the house to a resident?" "Absolutely," Peter Hames assured him. "I have always been told you live in a fortress, and I am quite willing to take it for granted." Whereupon Peter Hames took his leave. MR. PADDY COLLINS, sometime reporter on a New York newspaper, but now a man of means and the prospective owner of a château in the neighborhood of Monte Carlo, was having the day of his life. From his terrace he had watched the arrival of the American steamer, and in less than half an hour he had been back in his old world. Probably no man had ever a larger circle of acquaintances than had the ex-journalist. There were slapping of shoulders, cocktails, reminiscences, almost hugging, every few minutes. He lunched on board with a riotous crowd and afterwards extemporized a personally conducted tour of the bars of Monte Carlo. There was another riotous dinner at the Hotel de Paris, where Paddy himself was host, and afterwards an invasion of the Sporting Club. Then, one by one, his new friends began to fade away, for the ship was due to sail at midnight, and, although everybody agreed that Monte Carlo was as near Paradise as any place outside the United States could be, no one wanted to miss the boat. As the last carload disappeared, Paddy Collins felt lonely. He was indisposed to go home at this early hour. He needed genial and human companionship. He rang up the villa at La Turbie and was gratified to hear Peter Hames' voice replying. "Peter, my lad," his friend confided, "it's been the day of my life. I've met a hundred old pals, and it was good to see them. I think I'm sober, but I'm not sure. There's one thing very certain, I'm not for bed. Come down and see them off, and join me in a whisk around. You've missed the day of your life." "Have I?" Peter rejoined. "I've been keeping out of the way on purpose. I love my fellow countrymen, but not en masse and not tripping." "Step out of that, Peter, my lad. They're good fellows, all of them. I'm the best, and I'm alone and thirsty. Get into that little two- seater of yours, and give me a spin round." "I'll be down in a quarter of an hour," Peter promised. "Where are you?" "I'll be sitting in the bar of the Hotel de Paris, with a bottle of the best in front of me by the time you get down," was the grateful reply. "You're a wonderful fellow," Peter Hames exclaimed, a short time later, as he scrutinized his vis-à-vis. "How many drinks do you suppose you've had today?" "Oh, I'm always a bit of a bluffer with the drinks," Paddy Collins confessed. "I take my whack, and no one enjoys it more, but there's many a one goes overboard when no one's looking. It doesn't take alcohol to get me cheerful, especially since Uncle Henry died. But what a day! Peter, I'll tell you something that will make you howl. Did you ever know in your time at police headquarters anything of a man called Inberton? He was an inspector, I think, when you were there." "Yes, I knew him quite well," Peter acknowledged. "A funny business about him. You heard the rights of it, I suppose." "I have never heard anything of him since I left New York," he confided. "When I saw—"
"God bless my soul!" Paddy Collins interrupted, "Well, I'll have a drink on that," he went on. filling his tumbler, and his friend's. I'm telling you something that will make you laugh about Ernie Inberton. He was as smart as they make them, and he was the terror of every burglar in the States. He understood every trick there was in the trade, could walk into any house he chose at any time. "Now this story will make you laugh, Peter, if you haven't heard it, and I know you don't take the American newspapers. He became obsessed with his own skill—got into his blood, I suppose. One night there was a marvelous bank burglary—over a million dollars' worth of securities stolen—and there didn't seem a line on anybody. Then—I don't know how it was—some stupid little thing, I expect—it all came out. Ernie had done the burglary himself." THE glass which Peter Hames was holding to his lips went crashing onto the floor. He took no notice. "Say that again, Paddy," he demanded. "Ernie had done the burglary. He got four years for it. He was out about six months ago. I thought you'd have heard that. But listen, my lad, here's the cream of the joke. Live and let live, I say. Other people can go hunting wrongdoers; never me. Ernie Inberton is here with the rest of them, on the steamer. I saw him with me own eyes— Why, what's the matter with you, Peter? What's wrong, man?" Peter Hames was thinking rapidly. He glanced at the clock. Within a quarter of an hour of midnight. "Paddy," he said, "I've been the damnedest fool, but how was I to know? I met Inberton. He was still wearing his badge and he never breathed a word of any of this trouble. I believed him when he told me he was over here shadowing a man who meant to commit a burglary at Sir Stephen Diiscoff's tonight. I—listen, Paddy—I took him up there—fool that I was! I introduced him to Sir Stephen as an inspector in the New York police. I left him there with Sir Stephen, who was going to show him his strongroom and his burglar-proof safe, and all the rest of it!" If Paddy Collins had ever been in the least degree unsober, that time had passed. "By the grace of God," he exclaimed, "I have a gun in my hip pocket. Your car's outside. Let's leap into it, and make for the château. We'll likely enough be in time. A pleasant end to the evening it may turn out to be!" It was ten minutes to twelve when the two men left the Hotel de Paris, and twelve o'clock when they pulled up outside the Château de Roquebrune. There was no light in the porter's lodge, and the gates were locked. Neither of the two visitors was inclined to waste any time. Within a minute, they were both safely over the famous wall, which in itself was looked upon as being almost sufficient protection against marauders. They went up the avenue at a fast double, running on a strip of green grass in order to approach as silently as possible. Before them all the time loomed the huge, gloomy front of the château. Breathlessly they crossed the final circular sweep of the drive and arrived at the front door. Peter Hames drew down the great bell chain vigorously. The echoes had scarcely died away when, to the amazement of the two men, the door was thrown open. A manservant presented himself. "Sir Stephen," Peter Hames gasped. The man's reply was astonishing. "Sir Stephen will see you, gentlemen," the man replied. A little dazed, they followed the servant into a magnificent library on the ground floor. Sir Stephen, correctly attired in dinner suit, was seated in a comfortable easy-chair before a log fire. "Ah," he remarked, "my young friend of this morning, and a gentleman with whom I am not acquainted." "Mr. Collins, an American journalist," Peter Hames explained hurriedly. "He has just told me a most alarming story, Sir Stephen, I'm terribly sorry. The Inspector was a fraud. He has been in prison himself for burglary since I knew him. I'm afraid he was after your paper." "Dear me," Sir Stephen exclaimed without visible sign of emotion, "and I showed him all—or very nearly all—of my burglar-proof devices. This is most distressing." "We're in time, I hope?" Peter Hames continued. "We'll guard the room, if we may. We're both armed." "Martin was quite right," he reflected, "quite right. He was certain that you came in good faith. As regards your friend the Inspector," he added, rising to his feet, "it is perhaps time we went and had a look at him, Martin!" The secretary approached from the shadows in the background. "Let us," his employer suggested, "have a look at our visitor." They trooped across the hall, down a blank passage until they reached a door at the end. Martin drew a small gilt key from his pocket. "Will you gentlemen all stand back, please," he begged, as he fitted it into the lock. "Stand quite clear of the door until I have touched the switch." The door swung open. A little column of faint violet mist strayed out. Martin thrust his hand to the side of the wall, and pressed a plug. There was a sound inside like the rushing of wind. THEY stood grouped on the threshold, looking into what might have been an ordinary banker's strongroom, with several iron doors at intervals let into the wall. In one of them was fitted a key, and, flat upon the floor, below it, lay the Inspector, motionless. The room itself was still half filled with the violet mist, which was being rapidly sucked up, however, by a large tube hanging down from the ceiling. Sir Stephen bent over the prostrate body. "I showed him a good many of my antiburglar appliances," he explained, "but not quite all. I quite forgot to tell him how to shut off the poison gas. What do you think of him, Martin?" The secretary was on his knees. He opened the waistcoat from which still hung the badge of the ex-detective's non-existent office. Then he looked up, and shook his head. "I am afraid, Sir Stephen," he confided, "that we left him just five minutes too long."